1. The Size Guide - shows bird families together on one page, pictured by relative size. What a great way to focus on and learn overall size and shape. 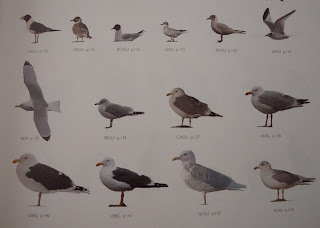 Size guides like this are especially helpful for species like gulls. 3. 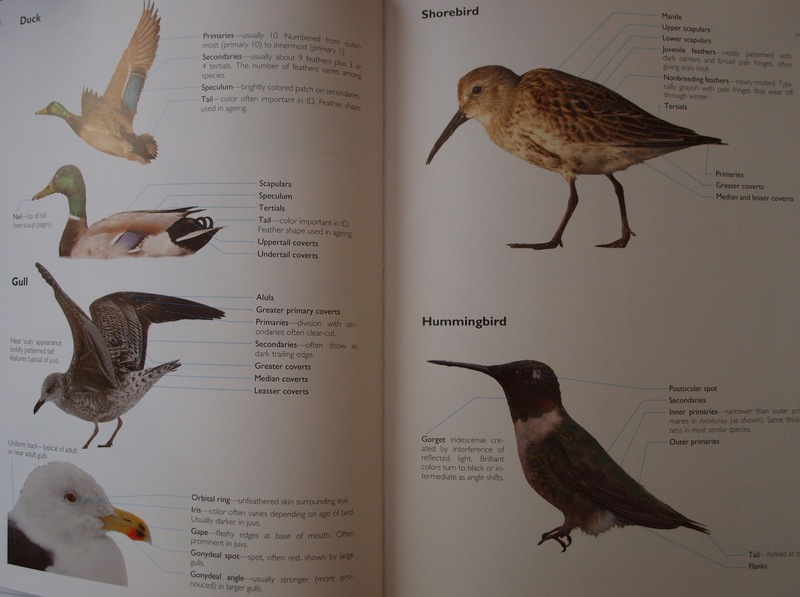 This guide contains more images of birds than any other to date. Birds are depicted in close-ups and varying distances, even to specs in the sky. This is very helpful. 4. Birds are depicted in probable habitat scenarios. You can see how they perch, fly, wade, or feed in a natural setting. This may not be accurate across a birds entire range, but good enough to convey the idea. 5. Each bird photo shown is there for a reason. Richard, or his staff, have taken the time to crop and manipulate each bird image. They wouldn't have gone to the effort without something to teach by each one. It is up to us to figure out what we can learn from it. Sometimes another species shown on the same page. It helps you understand the proportions and relative size. 6. Crossley doesn't include much in the way of vocalizations, and he even says he ended up including more than he originally intended to. I agree with Crossley that trying to teach vocalizations through a field guide is of little or no use. The most effective method I have participated in for learning bird vocalizations was in John C. Robinson's webinars. He would show his written out mnemonic, sing/say it how he knows it, then play a recording of the real bird call. Only then was I able to learn the vocalization and see how I could apply it myself in the field. Now this method of teaching mnemonic and bird vocalizations could be done in a digital format. 1. Maps - the maps are pretty good, but I still prefer Sibley's map showing migration. I am still hoping for all field guide creators to use a uniform system for color coding. I am also still anxious for the day that a field guide author says "I used eBird data to help me create the range maps". 3. Okay, so maybe a few plates are a little too busy or the background is too strong for my eyes to concentrate, for example the Rufous Hummingbird. Crossley did say he was going after reality and the reality of nature is that the background can sometimes be busy. Regardless, I think the plates are eye-catching and artistic and beg me to stare and study them. 4. I love Rick Wright's idea of making this a digital guide. I see it being a perfect tool for things like the iPad or other similar tablets. Cell phone apps would probably be too small to be really useful as a workbook. Crossley mentioned in his interview on the BirdChick podcast that he one day sees video-ID Giudes. I could totally see that on an iPad. Wouldn't that be cool! I really enjoy this new take on teaching birding skills through a workbook scenario. The Crossley ID Guide is beautiful, captivating, and a real gem. You'd better hurry up and get one now and bone up on those warblers!